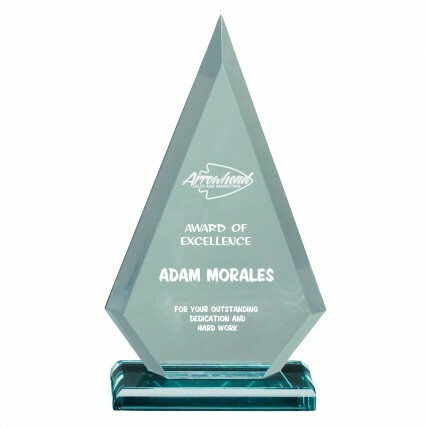 Get Jade Green Arrowhead Corporate Awards for your next event. These clear green acrylic awards feature beveled edges, a unique arrowhead shape, and three size choices. Medium: 5.5" wide x 9.75" high x .75" thick. Large: 6" wide x 10.75" high x .75" thick. Small: 8.75", Medium: 9.75", Large: 10.75"
Small: 8"x5", Medium: 9"x5.5", Large: 10"x6"